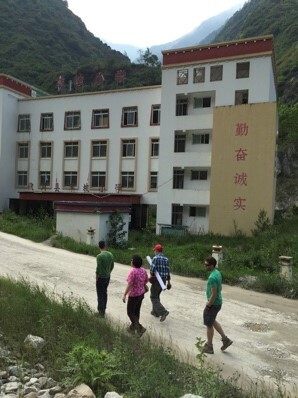 In May 2016 myself and colleauges travelled to China for the first meeting of our new project: Resilience to earthquake induced landslide risk in China (REACH). 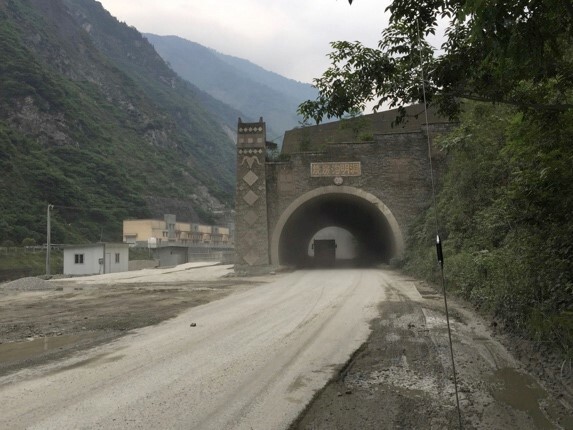 A partnership betwwen Cardiff Univeristy and the Chengdu Univeristy of Technology, the main research goal of the REACH project is to understand the relationship between landslide hazards and social vulnerability through the hazard chain to improve resilience. Our Cardiff University group; Dr Rob Parker, Dr Brian MacGillivray, Dr Yi Gong and myself (Dr T.C. Hales) arrived in Chengdu on the 19th of May. I’d had a pretty good sleep on the plane, we had been upgraded to economy plus, so I was able to stretch out and get a few hours of sleep! After our first interaction with Chinese traffic (more on that later) we were settled and ready for lunch. We were met in the hotel by Xuanmei and so began our introduction to Sichuanese food, at “spicy-level 1” according to Xuanmei. We all managed surprisingly well and headed out into a warm Chengdu afternoon to see the sights. Our hotel is about a mile from the State Key Laboratory of Geohazard Prevention and Geoenvironment Protection (SKLGP), the campus is compact sitting either side of a small river, an impressive, modern structure that made for quite the change from the Georgian Main Building of Cardiff University. Inside SKLGP is exciting for those of us that like cool equipment; a huge geotechnical centrifuge, more flumes than I could count, and UAV’s that look like ski planes. The tour ended as the jetlag kicked in and time for something at a “spicy level 3”. Day 2 consisted of a stimulating project meeting that lasted all day. SKLGP presented their work on landslide dam breaching, early warning system development, and models of hazards and risk. In return, Cardiff University presented research on debris flow initiation mechanisms, social vulnerability and cohesion, and engineering of the built environment. The project collaboration was beginning with an amazing range of ideas, expertise, and enthusiasm. This is going to be a cool project to work on! Day 3, my birthday, was a first chance to see the effects of a cascading hazard in detail. To do this required a 2.5 hour journey out of Chengdu. It is difficult to explain the first experience of driving on Chinese roads. To the uninitiated Chinese roads are mayhem; horns, cars arriving from various oblique angles, motorcycles, road works, occasional bicycles all happening at a pace that made my jet lagged brain hurt. We made it, some white-knuckle moments, but we made it. First, a museum to the 5.12 earthquake as it is called here. The museum is gripping and emotive, with the scale of the devastation explained in detail. From there it was to Beichuan, a place that will be carved indelibly in my memory. I have written the words “hazard chain” and “earthquake-induced landslide” many times in various documents that I have created, but to see a hazard chain in the form of a deserted town is probably best described as haunting. Day 3 was also a chance to see the debris flow problem that we are here to study in detail. 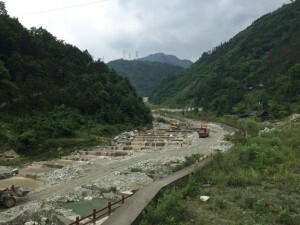 Close to Beichuan, a large coseismic landslide has filled a small stream with debris forming a small landslide dam. The dam had breached forming a steep gorge. Downstream of the dam, 2 10m high check dams have been built, destroyed, and rebuilt at least 3 times since 2008. Where does all of this sediment come from? How does it get down these channels? And how do we manage the risk of these debris flows that arrive quickly and can destroy multi-storey buildings? Left with more questions than answers, we headed back for a birthday hot pot…definitely “spicy-level 5”. Day 4 was supposed to be our rest day. Keen to see some pandas we woke up to rain, unfortunately as Xuanmei told us “pandas don’t like the rain”, so it was a nice lazy morning. That afternoon we tried to catch the train to Chongqing to see our SKLGP primary investigator, Professor Runqiu Huang, recently promoted to Deputy Minister of the Environment for China. We arrived at the Chengdu East train terminal and it was chaos once again. A city with a population of around 10 million people needs a big train station and Brian, Yi, and I, 3 PhD’s in geography between us, spent a good hour walking around trying to find ticket station 1 (located in the West Entrance to the West Square of Chengdu East train station). It was to no avail, the trains were all full to Chongqing, so instead of a 2 hour train journey we were in for a 4 hour, heart stopping, drive to Chongqing, complete with plenty of horn tooting, swerving and fully stopped traffic jams. Despite the journey it was worth it, arriving in Chongqing at night is an amazing sight. Located at a junction of the Yangtze River, the buildings in this mountain city are lit up, creating an expanse of flashing lights like nothing I have ever seen. Dinner was an introduction to baijo, the Chinese liquor. Fueled by the liquor, we made grand plans for the project, enjoyed some spicy local food, all in a guilded room in the city hall. Day 5 started at 293km/hr as we headed back to Chengdu on the fast train. The afternoon was a project meeting, arranging key elements of the grant, a way to share data and analyse the amazing amount of monitoring data SKLGP have collected. Day 6 saw us back in the field, this time to Yingxiu, earthquake epicenter. The day started as field days always do, in traffic. When we arrived in the mountains, we entered Yingxiu, another earthquake town that has been reconstituted as a tourist site. After another visit to a school damaged by the earthquake, heartbreaking for me, a Dad of young kids. A trip to the epicenter and time to see our second debris flow gully, Niumian gully. This gully was particularly interesting for a number of reasons. The first was that a long runout coseismic landslides had filled the valley, forcing residents to move into a reconstructed town. The result has been an increase in the quality of living for the residents, a counter-intuitive consequence of the earthquake. Secondly the debris dams constructed to manage the debris are full, and there was a digger there trying to excavate the material. 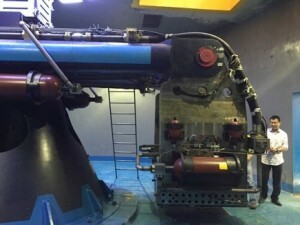 Essentially the engineering solution, built well, but without well constrained data on the amount of sediment generated by debris flows, have been overwhelmed in recent years. The result of this is expensive and uncertain, and something our project seeks to understand a little better. Lunch was in Shuimo, a tourist town that was also a resettlement location for the residents of Caopo, a town that was inundated by debris flows. An interesting observation was that most of the resettlements were empty, it seemed that people hadn’t taken up the resettlement for some reason. It turns out that people had to pay for the new houses, which may have been challenging. Were the people still in the town? It was our next stop so maybe we could ask them. On the way to Caopo, we drove the old Yinxiu-Wenchuan road, a road with a number of large debris flow gullies. The scale of engineering efforts to mitigate these landslides is unprecedented. Every gully has a specially designed tunnel with a debris flow chute above it to protect the road. Around each gully, every landslide is being mined for aggregate to service the concrete needs of the area. The whole place is a mass of earthworks equipment and concrete. We stopped by another interesting gully called Taoguan gully. Here, the road ended quickly and we were driving past factories, both working and abandoned, on a dirt road sitting on debris flow deposits. It was an introduction to another interesting post-earthquake phenomena in the area. After the earthquake, the local government encouraged investment and factory building, but as we were in the mountains, land is at a premium. The result is a bunch of factories built on debris flow fans. Since the earthquake any rain that falls, causes debris flows through each gully, destroying some factories, and leaving others clinging to the hope of some engineering mitigation before the next debris flow. How can we plan better for these phenomena? Finally the day ended at Caopo, a town inundated by debris flows, apparently abandoned, but still with a larger number of people walking around the village. Curious, we asked why. The residents simply said, “we were given a house but no land, how were we going to feed ourselves?” When asked what would happen in a debris flow, most people said they would just run up the hill. This reluctance to relocate has left the residents with some significant challenges. Because the town no longer exists in any official capacity there is no running water, no electricity, no sewerage, no rubbish collection, a big step back and a direct contrast to what we saw earlier in the day at Niumian gully. Yi stopped by the hospital, abandoned, but with an open door and a couple of doctors serving the basic needs of the community, as far as we could tell out of the goodness of their hearts. That ended a very interesting day. Day 7 was another one around Chengdu. 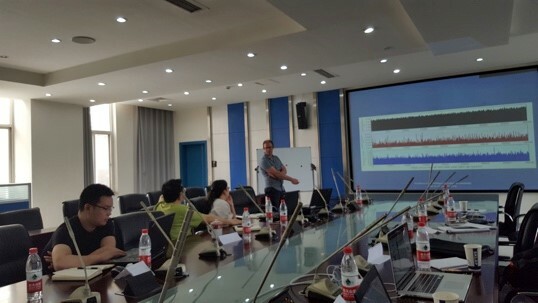 Xuanmei and I visited the Chengdu Mountain Institute to each give a talk. It was great to meet the team there, our other colleagues at the programme level. Day 8 was back into the field. We had lost the social scientists, who had decided that they were a bit sick of landslides. Professor Xu and Dr. Li joined us, planning on taking us to Qingping and the famous Wenjia gully, site of massive landslides and even more massive mitigation efforts. When we reached the road to Qingping it was closed, so plan B took us up into the mountains to Bailu town. The trip to Bailu took us through the small roads of the Longmenshan. Steep, winding, covered in a scrubby vegetation, at times trees, but mostly short shrubs and bamboo. This was panda territory. Descending into Bailu was a strange experience, suddenly French appeared on the road signs, and then a French style town and church appeared. We were off to see the surface expression of the fault. There was something poignant about this site. The fault split a school in half, 1 school building now rests 2 m higher than the other. The fault here is a thrust fault, so it looks like something made from Playdoh, not soil and rock. Here a school survived intact, no children died, it was a relief after Beichuan and Yingxiu. From there we drove back to Chengdu via Yingchang gully. 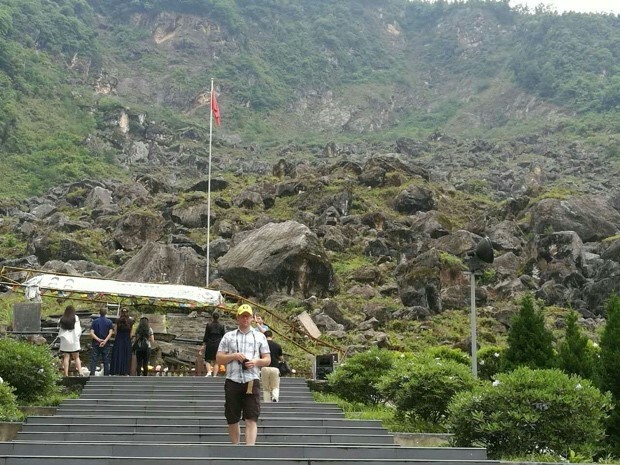 This site, close to the fault, is a tourist location, set in beautiful limestone mountains. The roads and some houses have been destroyed by debris flows. The remaining houses sit 10m above the main debris fan on a cliff made from the debris flow deposits created at some time in the past. Here the government is not willing to invest in engineering structures to support the community. They were building a bridge, Professor Xu thought was far too low to be a long-term solution, using their own money. A dramatic comparison to our experience around Yinxiu. For dinner, a night of hot pot and the Sichuanese changing face opera. Beautiful food and an interesting performance. Day 9 was into the field again. This time it was Brian and I heading to Qipan gully and Wenchuan. Qipan was another contrast. Here the Qipan debris flow fan was a site of resettlement and restoration after the earthquake. However a large debris flow event in 2013 destroyed a number of homes. The resulting engineering practice was impressive. Multiple check dams, including one that was at least 20 m high. Below the dams, the channel had been completely engineered to a scale that seemed to be disproportionate. It was the first check dam that I had seen that was empty. Again, we really lack a clear understanding of the hazard and it seems the response is to engineer in a haphazard manner. The end of the day was spent enjoying lunch in Wenchuan and a bit of shopping. I bought some great handmade shoes for my little girls from the local Qiang villagers. Again reconstructed Wenchuan seems to be bustling, possibly because of the post-earthquake investment. Well, that was pretty much it for the trip. The next two days were spent working on the final details of the collaboration and a trip to see the pandas. In all an amazing experience and I hope the start of a great collaboration.